The prime minister is expected to arrive early Saturday morning in northern France, heading immediately to the Canadian National Vimy Memorial near the city of Arras. Veterans Affairs Minister Seamus O'Regan will join Trudeau and representatives of veterans organizations for a ceremony honouring Canada's war dead. More than 650,000 Canadians served in the First World War between 1914-18, a significant contribution from a country with a population of only about 8 million at the time. Of those Canadians who fought, roughly one in ten, or 66,000, died. 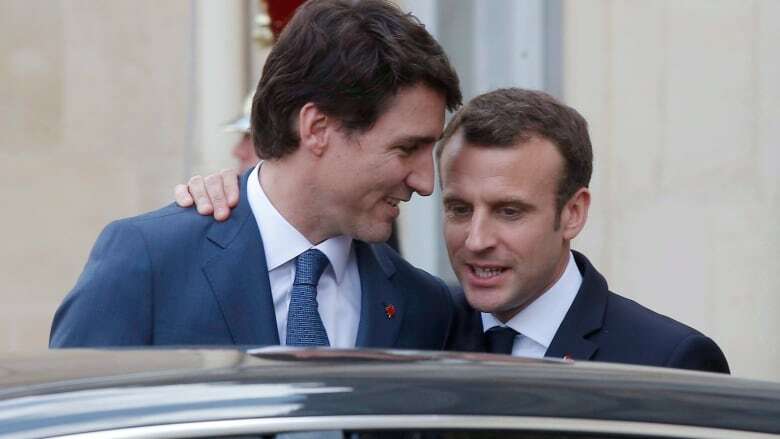 Following the battlefield commemoration Saturday morning, Trudeau will continue on to Paris, where French President Emmanuel Macron is hosting a group of world leaders for a private dinner at the Musée d'Orsay. On Sunday morning, exactly 100 years after the armistice that ended the war, Paris is hosting an international ceremony at the Arc de Triomphe on the Champs-Elysées. More than 60 heads of state and other foreign dignitaries are expected to attend, including German Chancellor Angela Merkel, U.S. President Donald Trump and Russian President Vladimir Putin. The media will be monitoring interactions between Trump and Putin at the event, although American officials have said the two leaders have no plans for an official bilateral meeting during their time in Paris. Following the armistice commemorations, Macron is expected to lead an anticipated 120 foreign dignitaries representing countries that fought in the war to the inaugural session of the Paris Peace Forum. Organizers intend the forum to be an "annual meeting for projects, ideas and initiatives which effectively contribute to better international cooperation on key global issues, fairer and more equitable globalization and a more effective and legitimate multilateral system." Macron, Merkel and UN Secretary General Antonio Guterres will speak to kick off the event. Later, Trudeau will be among other leaders headlining forum events Sunday afternoon. Trudeau will speak at an event organized by Reporters Without Borders (RSF), voicing his government's support for its recent international declaration on information and democracy, a six-page document that sets out "democratic guarantees for the freedom, independence, pluralism and reliability of information at a time when the public space has been globalized, digitalized and destabilized." During an event hosted by CBC's The National Thursday evening, Foreign Affairs Minister Chrystia Freeland said that press freedom was something that she and Trudeau had been reflecting on recently. "It is important for political leaders, and in particular political leaders of democracies, to speak out for journalists, and for your right ... to do your job ... to ask questions," she told CBC and Washington Post journalists featured at the event. Freeland's comments came after a confrontation between Trump and CNN reporter Jim Acosta at a White House press conference following the U.S. midterm elections earlier this week: the president refused to answer questions he did not like and repeated his claim that "fake news" outlets are "the enemy of the people." Acosta's press credentials were revoked later that day, deepening the acrimony between Trump's White House and the Washington press corps. "I think a lot of us have been thinking a lot about what makes democracies democracies," Freeland told the Toronto audience at the CBC event. "It's about a set of institutions and a set of behaviours that hold those elected leaders to account and keep them in check. "A free press … is absolutely essential to a healthy and functioning democracy." On Monday morning, Trudeau will join Macron at another of the forum's side events: the GovTech Summit, a "gathering of European leaders and innovators" focused on using new technologies to improve public services. The two leaders also are expected to meet privately on the sidelines of this event. After his time in Paris, Trudeau is scheduled to attend two major economic summits next week. First, he'll travel to Singapore, where the 10-country Association of Southeast Asian Nations (ASEAN) is holding its annual summit. Canada is not a member of ASEAN but participates in some of its activities as a "dialogue partner." Trudeau will be part of a Canada-China dialogue event in Singapore with Chinese Premier Li Keqiang. The following weekend, the 21 countries in the Asia-Pacific Economic Cooperation (APEC) forum are holding their annual leaders meeting in Papua New Guinea.